Held every year in May, the Otabi Festival is one of the three greatest festivals of Ishikawa, along with the Kanazawa Hyakumangoku Festival and the Nanao Seihaku Festival. Highlights include the magnificient Hikiyama floats from eight towns around the city and the children's Kabuki performed on two of those floats. The excitement and beauty of the festival reaches its peak in the evening. Children Kabuki performances are held throughout the festival. Around the end of August, the Osshobe dance contest is held to the strains of the Awazu folk song: Osshobe-bushi. The teams, who wear matching outfits and come from the many towns around the city and even the local inns to show off their dancing, are a delight to watch. In the evening, when the beautiful festival lanterns are lit, the festive mood takes over the entire city. 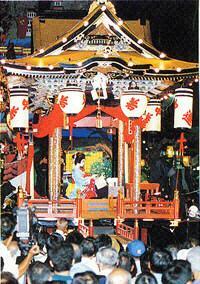 The Don-don Festival got its name from the large taiko drums that are often played during. The festival represents the desire of the citizens to better understand their traditional culture and to create new culture in order to develop the city in all its aspects. Every year on September 16, an exorcism ceremony held on the night of Hakusan Shrine's Autumn Festival. Two performers, one in a demonic looking male mask and another dressed as a pregnant lady dance madly in the light of the moon in this very powerful and moving scene. Held every October, the Ataka Festival is a prayer for good health and a bountiful fishing season. Beautiful portable shrines (mikoshi) are paraded around the town, with the highlight of the parade being a large float in the form of a boat carrying the Seven Foutune Gods. As the skies darken, young women dressed up traditionally in beautiful red kimono dance around in the circle. Traditionally, the women dancers are unmarried and about 20 years of age. It is a striking spectacle, not to be missed. Copyright (C) Komatsu City All Rights Reserved.